This blog & mini tutorial video is for you if you’re an entrepreneur like me using the power of video, especially Live Video to grow and expand your brand in the online space and want to look your most confident, personal best on camera. I also wrote this post for all the Shero Moms, Aunties, Grandmas & BFF’s out there who are busy multi-tasking & juggling your work life along with your family life, barely have five minutes in the morning for makeup & zero time for touchups throughout the day! I hear you! I get you! I applaud you! I was so excited to have the opportunity to collaborate with Sephora & ShopStyle Collective for their Fast and Flawless Campaign! I was sent a huge bag of different primers, setting powders and setting sprays to test out and these were my personal favs that will help you stay flawless all day in 3 easy steps: Prime, Cover, Set! 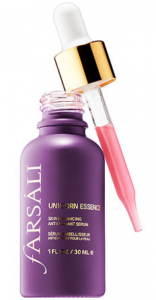 Farsali Unicorn Essence $54.00 http://shopstyle.it/l/gSws The name is marketing genius because who wouldn’t want the essence of unicorn amazingness bottled up for your convenience! It’s more than just a great product name! I love how this serum primer hydrates the skin giving it a soft glow without leaving a heavy greasy residue. This is a definitely a new staple in my daily beauty routine! Make Up Forever Step 1 Skin Equalizer Primer $37.00 http://shopstyle.it/l/gSxq Comes in different colors to address different skin types but the Natural Finish Smoothing Primer is my fav and “the best” in my opinion as it addresses both large pore and fine lines without feeling too heavy like some silicone primers can do and best of all, it doesn’t “pill” or ball up when you apply your foundation over top! 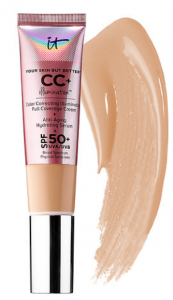 It Cosmetics CC+ Illumination Foundation $38.00 http://shopstyle.it/l/gSxl This has been a favorite foundation for so long that i’ve lost count! 5?6 years? Why does time go by so dang fast? There’s the original version and there’s this Illumination version which is what I go for when my skin looks a bit sallow & drab & could use a little extra oomph and glow without ever worrying about looking like a disco ball! 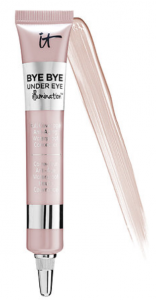 It Cosmetics Bye Bye Under Eye Illumination $24.00 http://shopstyle.it/l/gSxC This is the full coverage waterproof concealer I’ve been using for over 8 years now ever since I discovered it to use on the very hot & sweaty workout videos for Turbo Fire. You may heard my many stories about how I used it as foundation by sheering it out but it’s also the best concealer which can be used anywhere on the face and not just under the eyes! This is the Illumination version that adds a subtle glow to help blur skin texture & imperfections without ever looking overly shimmery. 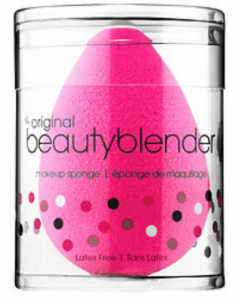 The Original Beauty Blender $20.00 http://shopstyle.it/l/gSCa They say that imitation is the sincerest form of flattery… Hmm, I bet to differ on that especially if you’re a course creator like me or the original inventor of the Beauty Blender! This is the OG and the one I always go back to even though there are many cheaper versions out there now but I will tell you that there is a HUGE difference in both quality and longevity! Pro Tip: The key to using the Beauty Blender properly is to use it damp. No, not soaking wet. Either run it for a few seconds under the faucet and squeeze out all the extra water or spray it with your favorite moisturizing facial mist like rose water. It Cosmetics Double Ended Brush $48.00 http://shopstyle.it/l/gSFu I’ve been talking about this brush forever too but when something is this good and I legit use this in my every day makeup application both to myself and my clients, you’re gonna see it on repeat! 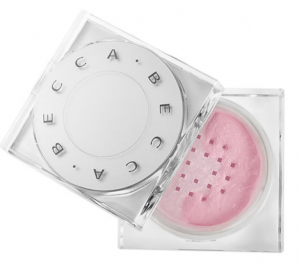 Becca Soft Light Blurring Setting Powder $38.00 http://shopstyle.it/l/gSzB This unique setting powder has a subtle pink tint that helps to brighten the skin,blur skin imperfections, fine lines & texture while imparting a soft glow to the skin. This is definitely a new obsession for me especially when my skin is looking sallow and blah! 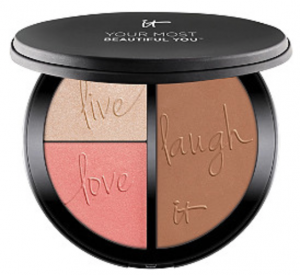 It Cosmetics Anti-Aging Face Palette $38.00 http://shopstyle.it/l/gSC2 Another multi-blog repeater! Yes, this is my desert island, holy grail bronzer/contour/highlighting/blush palette! It’s transformed over the years with different packaging but the amazingly beautiful, perfect product has remained the same! It’s my no-brainer, go-to product that i’ll love forever and ever and ever, Amen! Urban Decay All Nighter Spray $32.00 http://shopstyle.it/l/gSuU I’ve blogged about this product multiple times for the past 5+ years and that’s because it simply works especially when it’s extra hot & humid, you tend to naturally run hot all the time despite the weather, you need your makeup to last all day long for a special event like a wedding or you don’t want your makeup to be sliding off when you’re teaching a fitness class! I keep this in my pro kit at all times because it’s like extra insurance that the beautiful makeup look I created early in the morning on a shoot lasts throughout the day under hot lights and after multiple outfit changes. 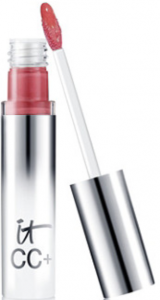 It Cosmetics Vitality Flush Lip Gloss in the color “Pretty In Pink” $24.00 https://shopstyle.it/l/VoMZ This is the perfect color that isn’t too dark or too light especially for camera. Isn’t too sheer, thin & runny causing mega lip bleeding. And it’s not too thick & goopy feeling either. It’s lipgloss perfection and another staple, go-to product when I don’t have time to line, use a separate lipstick and gloss over top. Just throw this on and you’re good to go! As always, thank you for reading my blog & supporting it by shopping through the links that I share. Don’t forget to subscribe here so you get notified when I share my next blog because I have so many things coming down the pipeline for you. Please comment below with your thoughts, ideas and feedback! Wanna get social? You can find me over on my fav social medias: Facebook, Instagram !